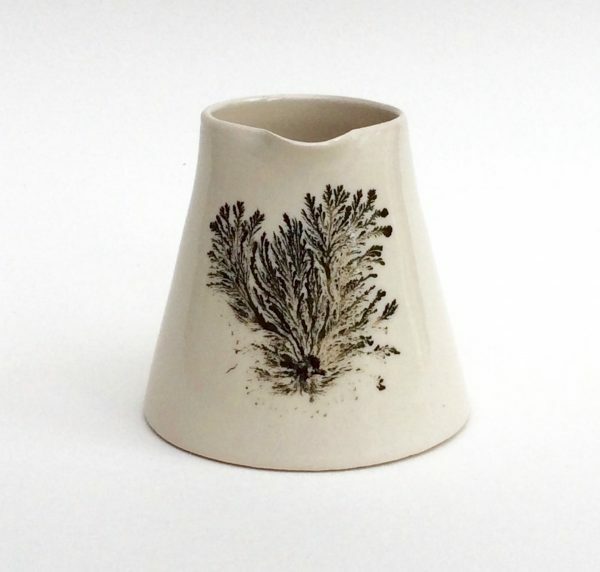 Abigail North trained in ceramics in London and later in Devon under the guidance of Bruce Chivers, and after a year as an assistant to the potter Penny Simpson, now works from her own studio on the edge of Dartmoor. She makes finely thrown porcelain and stoneware vessels which are carefully decorated by hand in a range of coloured slips, and glazed with a transparent glaze. A range of agate-ware pots, combining two different coloured clay bodies, are evocative of the granite stone found on Dartmoor. And in her studio adjacent to the moor, surrounded by beautiful ferns and lichen, the most recent project comprises of a series of bowls and vases with a delicate fern decoration, a modern reworking of the traditional mocha-ware decorating technique.